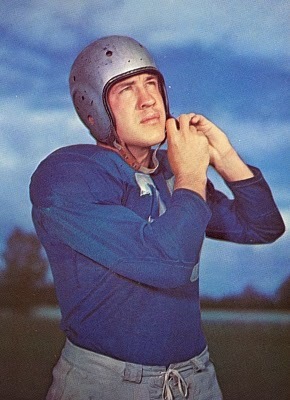 On August 6, 1947 the Pittsburgh Steelers sent star HB Bill Dudley along with tackle Jack Dugger to the Detroit Lions for halfbacks Bob Cifers and Paul White plus the rights to Michigan tailback Bob Chappuis, who still had a year of college eligibility remaining, and an additional first-round draft choice for 1948 that was used to take Texas QB Bobby Layne (whose rights were traded to the Chicago Bears but who would eventually conclude his Hall of Fame career with the Steelers). Having led the nation by scoring 134 points for Virginia in 1941, the undersized (5’10”, 180 pounds) Dudley was chosen by the Steelers with the first overall draft pick in ’42. His nickname “Bullet Bill” was rather misleading, as he was more elusive than fast. But he was a perfect fit as a tailback in Pittsburgh’s single-wing offense, allaying any concerns about his lack of size by leading the NFL in rushing with 696 yards in the eleven-game season. Dudley also passed for 438 yards (although passing with his sidearm delivery was not his best skill), returned 20 punts for a league-topping 271 yards (13.6 avg.) and led the NFL by averaging 27.1 yards on 11 kickoff returns that included a touchdown. He intercepted three passes on defense and his 1289 all-purpose yards topped the circuit. A fiery team leader, he was a consensus first-team All-NFL selection. Dudley then spent the next three years in the Army air force during World War II, returning to Pittsburgh for the last four games of the 1945 season. In ’46, he took up where he had left off as a rookie, again leading the NFL with 604 rushing yards, a 14.3 punt return average, 10 interceptions that he returned 242 yards, and 1378 total yards. For his efforts he received the Joe F. Carr Trophy as league MVP. However, Dudley, who took a beating due to his heavy use, expressed concern with the grind of playing pro football at his size (not helped by his difficult relationship with Head Coach Jock Sutherland, who didn’t appreciate his brashness) and indicated his desire to retire and return to the University of Virginia as an assistant backfield coach. Dudley turned down a $20,000 contract offer for 1947. Not surprisingly, when Dudley declared that he would no longer play for the Steelers, the team received many inquiries. The Lions persisted in negotiating the trade over the course of two weeks and Dudley agreed to terms with them for $20,000 plus a $5000 signing bonus, interrupting his honeymoon to fly to Detroit and sign the contract. As for the players the Steelers received, all three came out of single-wing offenses and were thus good fits for Pittsburgh’s system. 25-year-old Bob Cifers had played collegiately at Tennessee, where he was coached by Bob Neyland, a friend of Jock Sutherland’s, and was drafted by the Lions in the second round in 1943. He was a triple-threat halfback who had also been an outstanding punter in college and led the NFL in that category with a 45.6-yard average in ’46. Paul White was also 25 and an 11th round draft choice in 1944 who played one more season of college football for Michigan in 1946 after spending two years in the military. A left-handed halfback, he had been Michigan’s team captain. Also from Michigan, tailback Bob Chappuis was an outstanding all-around talent who was so highly-touted after setting a Big 10 record for total offense in 1946 that the Lions drafted him in the fifth round as a future pick. Jack Dugger, the player who was sent to the Lions along with Dudley, had been with Buffalo of the All-America Football Conference in 1946 and expressed a desire to play in Detroit, where he lived. He did so for two seasons before moving on to the Bears. The Steelers improved from 5-5-1 to 8-4, winning a share of first place in the Eastern Division but losing a playoff to the Eagles. Detroit had been a league-worst 1-10 in ’46 and moved up to just 3-9. Dudley became a halfback in a T-formation offense, and while his rushing total dropped to 302 yards on 80 carries, he caught 27 passes for 375 yards and seven touchdowns. He also continued to return kicks and had five interceptions on defense, and in all scored 11 TDs by means of rushing, pass receiving, a punt return, and an interception return. His all-purpose yards totaled 1322 in nine games, which ranked third in the league. He was also selected team captain by his teammates, who appreciated his leadership by example. Dudley played two more years with Detroit before moving on to the Washington Redskins, where he was named to the Pro Bowl in 1950 and ‘51. He finished up as a placekicker in 1953, making the most of his multiple talents to the end, and utilizing an odd style in which he didn’t take any steps but simply swung his leg once the ball was set. Overall, he ran the ball 765 times for 3057 yards (4.0 avg.) and 18 touchdowns, caught 123 passes for 1383 yards (11.2 avg.) and another 18 TDs, returned 124 punts for a 12.2 average and three scores, 78 kickoffs for a 22.3 average and a touchdown, and accumulated 23 interceptions that he returned for 459 yards and two more TDs. Dudley also passed for 985 yards and six TDs, punted 193 times for a 37.8-yard average, and kicked 33 field goals and 121 extra points. “Bullet Bill” was inducted into the Pro Football Hall of Fame in 1966 (he had already been selected to the College Football Hall of Fame in 1956). The Lions never had a winning record during Dudley’s time with the team. After contending in 1947, the Steelers lost Coach Sutherland, who died suddenly in the Spring of ’48, and went 4-8 that Fall. Bob Cifers played two seasons in Pittsburgh before moving on to Green Bay, rushing for 356 yards in 1947 and 361 in ’48. He averaged 40.4 on 130 punts over that period. Paul White played just one season as a reserve. Bob Chappuis never played for the Steelers, signing with the Brooklyn Dodgers of the AAFC in 1948 instead, and moving on to the Chicago Hornets in ’49, where he finished his brief pro career.